All the wrestlers above have profiles on Joshi City, you can click on their names to go straight to it. These matches won’t have a ton of backstory but I’ll at least fill in some gaps on who the wrestlers are and why they are on the card. A special AJW reunion match! 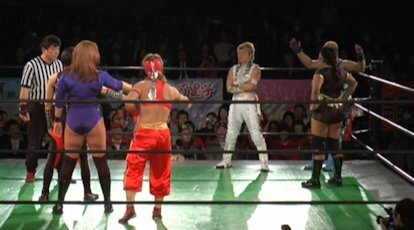 Yoshida and the team of Double Inoue all debuted on the same day (October 10th, 1988), so to help close out Yoshida’s career they are together one last time. Kyoko and Takako still wrestle pretty regularly, with Kyoko Inoue being part of the Diana promotion and Takako as a Freelancer who mostly does wrestler produced shows. On the other side, Jaguar Yokota is a true living legend and one of the top Joshi wrestlers ever, while Kaoru Ito is also a former AJW wrestler that still wrestles in Diana. And finally, there is Debbie Malenko, in her first official wrestling match (that I am aware of) since she was injured in AJW way back in 1993! Her and Yoshida had very little interaction so I am not sure how this came about, but I am excited to see her wrestling once again as she was a great young talent before her devastating leg injury. Yoshida and Malenko start the match, they grapple until Malenko gets Yoshida to the mat, but Yoshida switches positions with her as struggle for control. Malenko gets a short armbar applied but Yoshida quickly gets into the ropes for the break, Yoshida tags in Kyoko while Ito is also tagged in. Ito immediately hits a big lariat, she picks up Kyoko and the pair trade elbows. Short range lariat by Ito but Kyoko doesn’t go down, she returns fire as the veterans go back and forth with lariats. Kyoko wins the battle and tags in Takako, double Irish whip to Ito and she eats a double kick to the gut. Yoshida comes in too and poses on top of Ito, she stays in and tries to suplex Ito, but Ito blocks it and hits a back bodydrop. Ito throws Yoshida into the corner and hits a lariat, running senton by Ito and she covers Yoshida for two. Crab hold by Ito but she lets go after a moment, Irish whip by Ito but Yoshida flips over her back and cradles Ito for two. Yoshida tags in Takako, boots by Takako to Ito but Ito lariats her to the mat. Takako elbows Ito away and delivers a high kick, but Ito eventually has enough and drops her with a uranage. Ito tags in Yokota but Takako catches her with a backdrop suplex. Yoshida comes in but Yokota sends them both down, they recover however and Takako cradles Yokota for two. Yokota recovers and shoulderblocks Takako into the corner, Irish whip by Yokota but Takako hits a bridging backdrop suplex for two. She tags in Kyoko, lariat by Kyoko but Ito runs in and lariats Kyoko. Things break down as all six come into the ring, Kyoko gets Yokota onto the top turnbuckle and hits a superplex for two. Kyoko picks up Yokota and goes for a powerbomb, but Yokota reverses it with a hurricanrana. Somersault legdrop by Yokota and she tags in Malenko, who comes in the ring with a diving face crusher for two. Running back elbow by Malenko and she hits a second one, but Kyoko chops her to the mat. Malenko goes for a cutter but Kyoko pushes her off and tags in Yoshida, double underhook facebuster by Yoshida and she covers Malenko for a two count. Irish whip by Yoshida but Yoshida is grabbed from the apron, giving Malenko a chance to deliver a boot. Yokota comes in and helps Malenko hit a double backdrop suplex onto Yoshida, before Ito follows with a diving footstomp. Malenko picks up Yoshida and delivers a Northern Lights Suplex, but the pin is broken up. STF by Malenko but Yoshida crawls to the ropes to get the break. Everyone runs in the ring as the action breaks down, Kyoko lariats both Ito and Malenko and Yoshida cradles Malenko for two. Yoshida picks up Malenko and puts her in the Spider Twist, and she has no choice but to submit! Double Inoue and Mariko Yoshida are the winners! No break for Yoshida, as she wrestles again on the very next match, this one with an ARSION theme. Teaming with her is Melissa (aka Cheerleader Melissa) in her first match in Japan since 2015, along with PURE-J wrestler and former ARSION wrestler Leon. They are against Aja Kong and AKINO, who are both current OZ Academy wrestlers and former ARSION wrestlers. Finally, Mary Apache is a current champion in Stardom but also had many matches in ARSION, so her spot in this match is deserved as well. Yoshida and AKINO start the match, AKINO immediately sneaks in a backslide but it gets a two count. AKINO goes off the ropes but lll kicks her from the apron, Yoshida and AKINO grapple on the mat and trade submissions until they reach a stalemate. lll and Apache tag in, armdrag by lll but Apache returns the favor as they go back and forth. They reach a stalemate as well as they return to their feet, Irish whip by Apache but lll delivers the spear. lll tags in Melissa, elbow drop by Melissa and she applies the Kondo Clutch, but Apache gets into the ropes. Apache gets away from Melissa, Melissa goes for a scoop slam but Apache blocks it and lands on top of her. Heel kick by Apache and she tags in Kong, Irish whip by Kong but Melissa hits a lariat. Kong doesn’t budge, they both try to knock the other one over but Kong outsmarts Melissa and knocks her to her knees. Kong picks up Melissa but Melissa knocks Kong to the mat with a lariat, diving strike by Melissa and she tags in Yoshida. Kong punches Yoshida in the throat and kicks her in the head, she goes for a suplex but Yoshida lands on her feet and applies a sleeper. Kong almost goes to sleep but gets a hand on the ropes in time, Yoshida goes for a suplex but she can’t get Kong over. Leon comes in to help but Kong suplexes both of them instead, giving her time to tag in AKINO. Kicks by AKINO to Yoshida but Yoshida blocks a lariat attempt and puts AKINO in the Spider Twist. AKINO rolls out of it and puts Yoshida in the Spider Twist instead, but Yoshida also rolls out of it and applies an ankle hold. AKINO gets out of it and puts Yoshida in a cross armbreaker, but Yoshida pins down AKINO’s shoulders for a two count. High kick by AKINO, Apache runs in but Yoshida blocks her powerbomb attempt and throws Apache out of the ring. AKINO has gone up top in the meantime but Melissa joins her and hits an avalanche Samoan Drop, Leon goes up top and nails a somersault senton onto AKINO for a two count. Leon picks up AKINO but AKINO blocks the Capture Buster, Apache runs in and lariats Leon before Kong drops her with a backdrop suplex. High kick by AKINO, she covers Leon but Yoshida breaks it up. AKINO picks up Leon but Leon slides away, she goes for a sunset flip but AKINO blocks it. Melissa runs in and elbows AKINO, double underhook facebuster by Yoshida to AKINO and Leon delivers her diving body press for another two count cover. Leon picks up AKINO but AKINO avoids her kick and punches Leon in the head. Yoshida tries to help but boots Leon by accident, Melissa comes in but she is shoulderblocked by Kong and Apache. Kong and Apache accidentally run into each other, Leon goes off the ropes and delivers a high kick, but AKINO snaps off a hurricanrana for the three count! Aja Kong, AKINO, and Mary Apache are the winners. Mariko Yoshida gets a chance to relax before the main event, as we get an IBUKI-themed match as all four wrestlers had matches in Yoshida’s former promotion. Aoi Kizuki is a Freelancer that mostly wrestles in PURE-J and OZ Academy, she teams with Misaki Ohata who is one of the top wrestlers in Pro Wrestling WAVE. They face off against K-DOJO wrestler Bambi and DDT wrestler Cherry, both of which wrestled for IBUKI early in their careers. Aoi and Misaki attack before the match starts and double team their opponents in the corner, double vertical suplex to Bambi and they then suplex Cherry on top of her. Ohata and Cherry stay in as the legal wrestlers, Misaki tags in Aoi and Aoi hits Mongolian Chops onto Cherry. Elbow by Aoi in the corner and she hits a face crusher, running senton by Aoi and she covers Cherry for two. Misaki returns but Cherry hits a jumping neck drop on both of them, Cherry picks up Aoi but Aoi snaps her back over her knee before slamming Cherry fast-first into the match. Aoi goes for a diving senton but Cherry moves, Cherry goes for an armbreaker and gets it locked in, but Aoi quickly wiggles to the ropes for the break. Cherry tags Bambi, Bambi chops Aoi in the corner and Cherry returns as both hit running hip attacks onto Aoi. Irish whip by Bambi, reversed by Aoi but Bambi avoids her charge and hits a high kick. Running boot by Bambi, and she covers Aoi for two. Bambi charges Aoi but Aoi kicks her back and applies a sunset flip for two, Bambi goes off the ropes but Aoi chops her in the chest and hits the double wrist-clutch armsault. Jumping lariat by Aoi and she tags in Misaki, Misaki elbows Bambi in the corner and delivers the low crossbody. Misaki goes up top but Bambi ducks the crossbody and boots Misaki in the face. Misaki fights back and dropkicks Bambi in the face, she goes off the ropes but Bambi delivers a big boot again. Bambi tags Cherry, Cherry goes up top and hits a missile dropkick, double Irish whip to Misaki and she is knocked down by a double shoulderblock. Body press by Bambi, Cherry goes to the top turnbuckle and nails the Swanton Bomb, but Aoi breaks up the cover. Cherry goes off the ropes but Aoi elbows her, Misaki cradles Cherry but it gets a two count. Bambi tries to help but boots Cherry by accident, lariat by Misaki to Cherry and she hits a German suplex hold for a two count. Misaki picks up Cherry and nails the Fisherman Buster, but Bambi breaks up the pin. Misaki picks up Cherry but Cherry gets away and chops her in the face, uranage by Cherry and both wrestlers are down. Cherry recovers first but Aoi dropkicks her, double Irish whip to Cherry but Cherry avoids them both and cradles Misaki for two. Bambi is back but Aoi throws her out of the ring, Misaki cradles Cherry from behind but Cherry reverses it as they trade flash pins. Spinning chop by Ohata and she applies a hammerlock into a cradle for the three count! Misaki Ohata and Cherry win the match. This felt like a standard midcard tag match, which is to say it was perfectly fine but nothing memorable about it at all. Bambi can’t really keep up with Aoi and Misaki so the pace wasn’t quite what you’d expect, and some of the strikes were a bit loose. Cherry looked inspired though and had a lot of emotion, and generally speaking nothing was really wrong with it and they kept it short. Decent enough but nothing more than that. And we have reached the final match of the night, which is also the final match of Mariko Yoshida’s career. Yoshida trained Hiroyo Matsumoto before she debuted in 2006, and Hiroyo immediately found success as she even pinned Yoshida just a year into her career – which is unheard of in Japan. Fast forward to 2017 and Hiroyo is one of the top Joshi wrestlers, which I’m sure Yoshida is very proud of. It makes sense that Yoshida is closing her career against her most successful pupil, and while I am sure it will be emotional I am also sure that Yoshida will hold nothing back to end her career on the highest note possible. Yoshida asks for Matsumoto’s hand as the match starts, Matsumoto goes to shake it but Yoshida cradles her for a quick two count. Starting her retirement match with a bang. Kick to the stomach by Yoshida and she throws down Matsumoto by the hair, another kick by Yoshida and she covers Matsumoto for two. Choke by Yoshida and she puts Matsumoto in a headscissors, but Matsumoto quickly gets out of it. Bodyscissors by Yoshida but Matsumoto gets out of that as well and puts Yoshida in a crab hold, Yoshida crawls to the ropes and she reaches them to force the break. Chops by Matsumoto, she gets Yoshida on her shoulders and tries to decide where to toss her, with the wrestlers at ringside trying to discourage her. Matsumoto eventually tosses Yoshida out of the ring anyway and down onto the wrestling mob at ringside, but the wrestlers help out and hold Matsumoto out on the floor so that Yoshida can go to the top turnbuckle and dive down onto Matsumoto. Back in the ring, Matsumoto puts Yoshida in the corner and all the wrestlers at ringside come into the ring to take turns on Yoshida, with a variety of strikes, hugs, and even a kiss. Yoshida comes out of this two minutes later in pretty rough condition, Matsumoto covers her but she only gets a two count. Crab hold by Matsumoto but again Yoshida reaches the ropes, scoop slam by Matsumoto and she delivers the reverse double kneedrop, but Yoshida gets a shoulder up. Matsumoto goes up top and she hits a missile dropkick, another cover but she only gets two. Yoshida slaps Matsumoto but Matsumoto slaps her back, Matsumoto goes for a powerbomb but Yoshida gets out of it and applies the sleeper hold. Spider Twist by Yoshida but Matsumoto gets up while still in the hold and slams Yoshida into the turnbuckles. Yoshida flips Matsumoto and applies a cross armbreaker, but Matsumoto gets to the ropes. Boots by Yoshida but Matsumoto hits a body avalanche against the ropes, she goes for the sliding lariat but Yoshida ducks it and puts Matsumoto in an armtrap facelock. Yoshida reverts it into the Spider Twist but after struggling for a bit, Matsumoto is able to make it to the ropes. Yoshida picks up Matsumoto and goes for the Air Raid Crash, but Matsumoto blocks it and goes for a powerbomb. Yoshida rolls out of it, Matsumoto goes for the backdrop suplex and eventually hits it, but is too hurt to make the cover. They slowly get up and trade strikes, with Matsumoto winning the battle with a hard club to the head. Matsumoto picks up Yoshida but knocks her back down with an elbow, she drags Yoshida to her feet and nails the powerbomb, but Yoshida gets a shoulder up. Matsumoto picks up Yoshida and goes for the backdrop suplex, but Yoshida reverses it with the Air Raid Crash! She’s too hurt to make the quick cover, she eventually does so but Matsumoto kicks out. Back up, hard lariats by Matsumoto and she nails the Backdrop Driver for the three count! Hiroyo Matsumoto is the winner! As I mentioned at the top, I really enjoy retirement shows and this one delivered. I liked that aside from a brief moment in the main event, all of Yoshida’s matches were down-to-business and serious. It still had all the emotion you’d expect from a wrestler’s last series of matches, but it stayed true to her career to not have a lot of playful moments. The AJW reunion match was even better than I expected, and the ARSION match was fun as well. The main event was great as they both held nothing back, and Mariko Yoshida showed she still has the technical skill to hang with anyone. An entertaining show, it may be hard to find but if you can I’d recommend it, its a must for any Mariko Yoshida fan.